One of the best advantages of heading outdoors, even for a short amount of time, is the benefit of soaking up some sunshine. Sun exposure generates vitamin D, which is necessary for a healthy brain, bones and muscles, according to Dr. Michael Raab a geriatrician in Fort Myers, Florida. Actually, some doctors prescribe sunlight as a source of vitamin D, instead of taking a supplement. Research has shown vitamin D improves cognitive function and mood. Somewhat similar to improved health due to increased levels of Vitamin D, spending time in the outdoors has also been directly linked to an improved immune system. According to a study at Tokyo’s Nippon Medical School, women who spent six hours in the woods over a time span of two days showed an increase in virus- and tumor- fighting white blood cells subsequently. This boost even lasted for a minimum of seven days. Hence, seniors should try to spend more time outdoors in order to reap these fantastic health benefits. Additionally, being outside provides mental and emotional benefits. Heading to the great outdoors, the mental and emotional benefits are great. It gives your loved one the ability to socialize with new people, also many outdoor activities allows them to interact with children and animals. Such activities can give people an extra spring in their step, and rejuvenate their emotions, according to Christina Chartrand, vice president of training and staff development for Senior Helpers, a nationwide in-home care company. Nature is fuel for the soul. Often when we feel depleted we reach for a cup of coffee, but research suggests a better way to get energized is to connect with nature. Richard Ryan, lead author and professor of psychology at the University of Rochester. 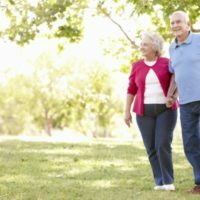 As the weather gets warmer and brighter, you and your loved one should, of course, use your best judgement when it comes to being outdoors, always taking into consideration their mobility and other health concerns. While the benefits and positive effects being outside will have on your loved one, you will also enjoy the benefits as well.